On October 27, 2011 was a more then normal chilly night in the state of Pennsylvania. There is an irony to the situation. It was about the same time of year that Ziggy's dad went on tour for his Survival album in 1979. The gods in heaven must have been talking and saying "A true Rastaman and his message of Love" was back in the area 31 years to the date. Because, it had the smell of snow in the air. The next day Philadelphia was going to see the first snow storm in October since that year in 1979. 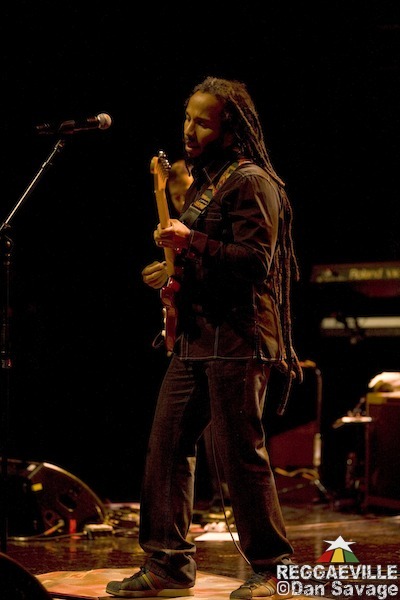 Ziggy Marley who is promoting his new album Wild and Free and his nine piece band came to a town right outside Philadelphia, Pennsylvania. The town which is called Glenside and the theatre which is called the Keswick Theatre is a great small town community. It was the first time I had the chance to see a show in that town and theatre. Since it is the beginning of fall/winter, the town had the trees lit up on the main avenue. It gave it a small town feel right outside the United States fourth biggest city which makes the venue special. When I arrived, I was personally surprised on how small the town itself is. Now, this is not negative it was actually very positive. The theatre itself was an 1930's movie theatre converted in to a concert hall, it still has it's old charm to it. It fit the Wild and Free tour perfectly. I have to say that it was a great job by the people who booked this tour to pick this theatre. I got in to the line to pick up my tickets and guess who I run in to? Someone I have been trying to track down for the last ten years. The man is Kenny Gamble who is partners of Gamble and Huff fame. He has only been apart of 170 gold records in his life. 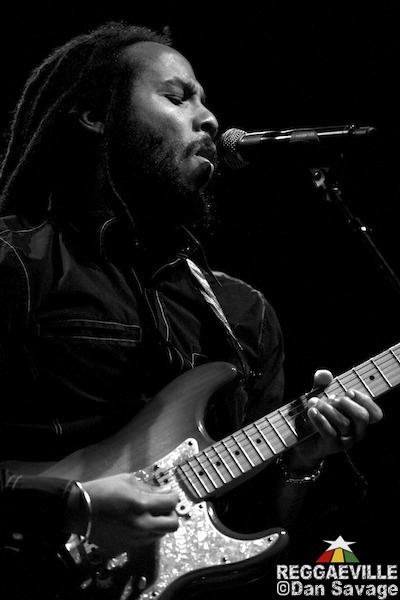 You might ask why is he so important to a Ziggy Marley show other then if the industry is going to the show on that note alone it usually is a great show. Well, Kenny Gamble is also the co creator of the BMA. What I have researched about the BMA might have been one of the best musical moments in 20th century. Other then giving a voice to African musician it was where Bob Marley and Stevie Wonder joined on stage to perform for the last time together in summer in 1979. I had the chance to talk to him about the show and he was amazed I even knew about the show. Even though the show in 1979 was for industry only insiders it is so historic and myself being a history major it was right up my field. Then, I meet up with Dan Savage the photographer and plan out what shots he is going to take with his graceful eye and where I am going to watch the show so we have a complete feel of the show from two different angles. I finally get to my seat and who is up on stage? Leon Mobley with his band Da Lion opening for Ziggy. I had to do a double take! I have been friends with Leon for the past ten years starting when he was with Ben Harper's band the Innocent Criminals. This was starting to be a night that I was not even sure I was going to go and now all the stars in the heavens are lining up. Leon puts on a great show, and if people do not know Leon Mobley please google his name and learn about him. He is historically keeping the art of African Drumming alive in the Western Hemisphere, and if you call yourself a fan of music you need to know the name Leon Mobley. I was told Ziggy and his band was not going on until 9:15 so I had a chance to watch and talk to members of the crowd. As luck would have it, I ran in to three people who saw every show of Bob Marley and the Wailers in Philadelphia from 1976 to 1979. They told me stories about the shows and how they were really excited to see Ziggy play a show in the Keswick theatre. They mention more then one time that it has the same feel as the Tower Theatre in Upper Darby which Bob Marley played in 1976. Ziggy and his band came on at 9:15 right on time. They jammed from start to finish. I have personally attended about 30 Ziggy Marley led show and I have to say every year he gets better. I don't know if its because his style is changing or that he has a different message. What I do know is that his shows are starting to become epic in the sense he is not playing the same show every night and he is jamming out every show. This to me and other fans of music should realize that everytime Ziggy and his band go on stage it is a real treat. The band opens up with a track from his new album Wild and Free Welcome to the World. It was a nice old school vibe which Ziggy brings through his New Album Wild and Free. The next song is Be Free which is off Love is my Religion Album a nice setup for the next track which is my favorite song that Ziggy has written in my eyes. Personal Revolution which again comes off the album Wild Free. It is a true original reggae vibe on that track. Which fades nicely in to the song Beach in Hawaii another reggae vibe more laid back but still good vibe. Then he brought a little old Bob Marley song out with Stir it Up. Not my favorite Bob Marley song but still a crowd pleaser. Then he played a few more tracks off of his solo albums. The one that stands was Black Cat due to how close it was to Halloween it was the perfect song. When you are at the show you can see how much Ziggy matured as a real professional performer. He extended every song during the show and really jammed out more then he has in the past. This always adds an element to the show that makes it own and very special. This makes going to different tours dates well worth it. You know that the same set list isn't going to play and he and the band are not just going through the motions. You can see in the performance that Ziggy is using the music as a vehicle to spread his message. By the middle of the show Ziggy has me full believing in the songs and his message he is bring on the tour. The final part of the show he does some of his Melody Makers hits Tomorrow People and Justice. Then going in to his fathers classic song Get Up Stand Up with his own alternate lyrics, which adds a personal note. Always nice to see that in a cover song. Finally Ziggy finished his set with Wild and Free and True to Myself both solid tracks with a nice jam by the band.Then Ziggy went off stage. Thinking that would be it for the night Ziggy and the band surprised the whole audience with one final encore with a song called Changes. I really enjoyed this song and makes me think about changes in life.